The Chinese Cup series brings us a lovely tale of what happens when you build a street course corner just a tad too small. 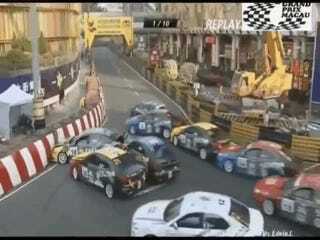 You get a pileup that stops the race! Lisboa Corner at Macau is quite narrow, and clearly tighter than the two lead cars expect. They come in too hot, understeer into a barrier, and the cars behind them completely flub the same corner trying to avoid the first two cars' crash. This, of course, blocks the entire width of the two-lane stretch of track so that no one can pass. Oops!